Treated water is provided to the Village of Duchess from the Newell Regional Services Corporation. Water quality is continuously monitored by the NRSC and Village of Duchess operators, both of whom report analysis directly to Alberta Environment. Billing for Village of Duchess utilities is done bi-monthly with meter readings taken remotely via radio signal at the time of billing. The bulk water fill is located on the North side of the fire hall at 251 Railway Avenue. Bulk water accounts can be set up through the office or payment can be made onsite with coins. Bulk water rate is $2.83/cubic metre or $3.78/cubic meter for commercial accounts. Wastewater is collected and processed at a settling and storage facility outside of the Village. Please adhere to the guidelines below. Sewer back ups are an easily preventable but potentially extremely costly repair for homeowners. 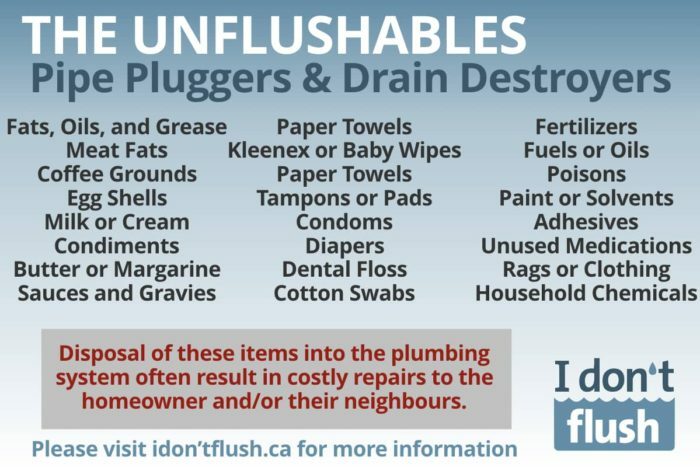 Please visit idon’tflush.ca to familiarize yourself on what cannot be disposed of into the sewer system. 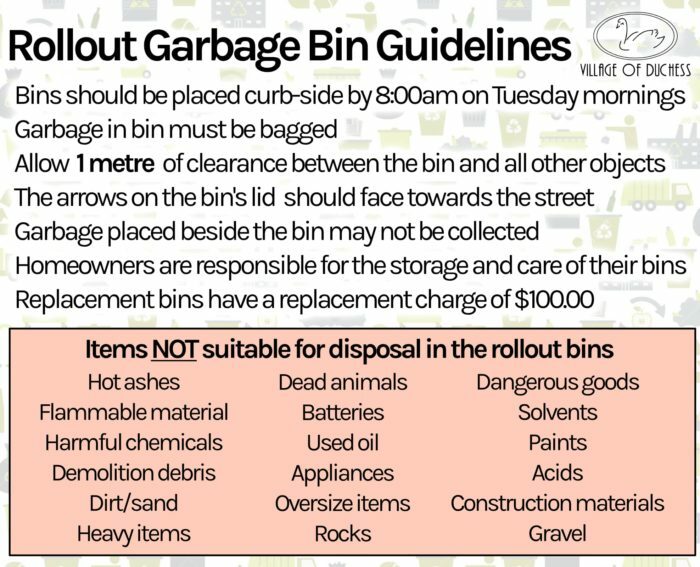 Garbage collection is on Tuesday mornings. Personal trash that cannot be accepted according to the Village of Duchess garbage removal guidelines must be taken to Newell Regional Landfill located South of the Village on Highway 36. 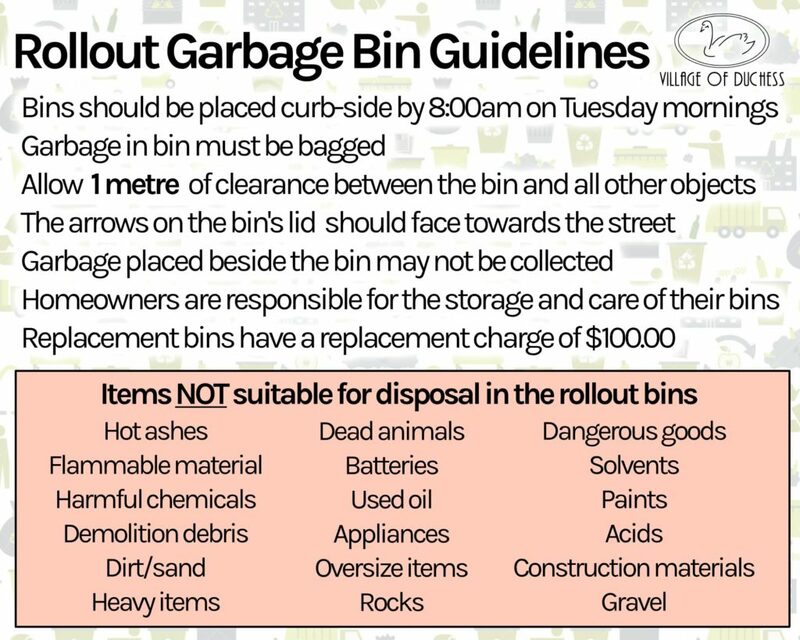 Residents are responsible for the bin assigned to their property and are encouraged to mark it as their own. There is a $100.00 replacement charge for missing bins. ​Please make use of the recycling shed located behind the fire hall at 251 Railway Avenue. Cardboard, tin cans, and newsprint are collected there. A yard waste drop-off is opened at the Village of Duchess Public Works Yard during the summer months. Only unbagged grass clippings and garden waste is accepted here. Branches are not accepted at this time. The Back Alley Clean Up is an annual event that takes place in the spring to help residents dispose of garbage that cannot be accepted during regular pick up. More information can be found here. Power is supplied to the Village of Duchess through Fortis Alberta. Burnt out or cycling street light repair orders can be submitted via the Outages Map on the FortisAlberta website. Outages can be reported to Fortis Alberta by phoning 310-WIRE. When the power goes out in Duchess, an emergency pump system is in place keep an uninterrupted water flow to all of the supplied properties in the Village. This system is designed to ensure that fire hydrants are always functional and that drinking water is always available. Due to the reduced capacity of the back up system, we ask that you turn off sprinklers and otherwise limit your water use during power outages to make certain that pressure remains adequate to operate the fire hydrants in the event of an emergency. Thank you! Natural gas is supplied to the Village of Duchess through ATCO Gas. For questions regarding natural gas delivery contact ATCO Gas at 310-5678 or at www.atcogas.com​. Please visit the Canadian Government’s “Get Prepared” website to familiarize yourself with the procedures for dealing with catastrophic emergencies. We recommend creating a plan and maintaining an emergency kit that adheres to their guidelines. Visit the Alberta Emergency Alert website for up-to-date emergency notices and information. Any water, sewer, or garbage disposal questions can be directed to the Village of Duchess office.